Liam Neeson has always stood up for what’s right (as Oskar Schindler, as Rob Roy, Michael Collins, hell, even as Qui-Gon Jinn) – but he’s never been so BADASS about it. 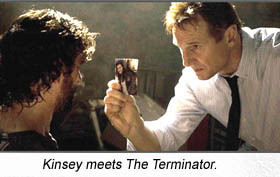 In the European production, TAKEN, Neeson is Bryan Mills, an ex-CIA operative – he calls himself a “Preventer of Bad Things” with “a very particular set of skills” – whose 17-year-old daughter, Kim (Maggie Grace) travels to France and is kidnapped by Euro slave traders for Mid-Eastern royalty and super-rich white men. And Mills comes to her rescue, kicking arse, taking names and leaving no prisoners. In short, utterly proposterous. And utterly enjoyable. And utterly Euro (written by the great Luc Besson and directed by Pierre Morel), meaning there seems to be little or no stinking MPAA presence; Neeson can get away with shooting bad guys in the back (without them drawing on him first), torturing bad guys (while describing how the “U.S. outsourced these techniques”), killing ruthlessly and callously, in short, stooping to the bad guys’ level to get the job done – rescue his daughter. Famke Janssen is the ex-wife, underused, Xander Berkeley is the ex-wife’s rich new hubbie, also underused; ingenue Maggie Grace keeps reminding us of how much better Kristen Stewart would’ve fitted her role; and Leland Orser is one of Mills’s CIA buddies – and he’s NOT whining about anything. With TAKEN being such a hard, satisfying ride, I wouldn’t be whining either. Starring: Liam Neeson, Famke Janssen, Leland Orser, Radivoje Bukvic, Mathieu Busson, Holly Valance, Katie Cassidy, Xander Berkeley, Nicolas Giraud, Maggie Grace, Jon Gries.